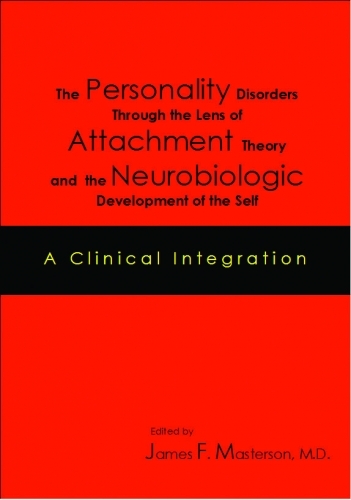 The culmination of 40 years of research into the personality disorders, this book documents the breakthrough integration that has brought Dr. Masterson’s theory into its fullest possible dimension. Initially descriptive, it evolved into a developmental theory, then into a developmental object relations theory, and, finally, into a developmental self and object relations theory. Now, with the recent emergence of attachment theory and the theory of the neurobiologic development of the self, the picture is complete and a clear and comprehensive statement to depict the origin and development of the personality disorders has taken shape. Dr. Masterson and his fine team of coauthors have assembled a rich and comprehensive volume that features discussions of transference and countertransference, consciousness, mother-infant attachment, the psychotherapy of trauma, and therapeutic neutrality under challenge, among many other important topics. The members of the team are Margot T. Beattie, Barbara L. Short, Donald D. Roberts, Ken Seider, Steven K. Reed, Joseph Farley, Jerry S. Katz, and Judith Pearson.